Praid started great start in the adult classes. 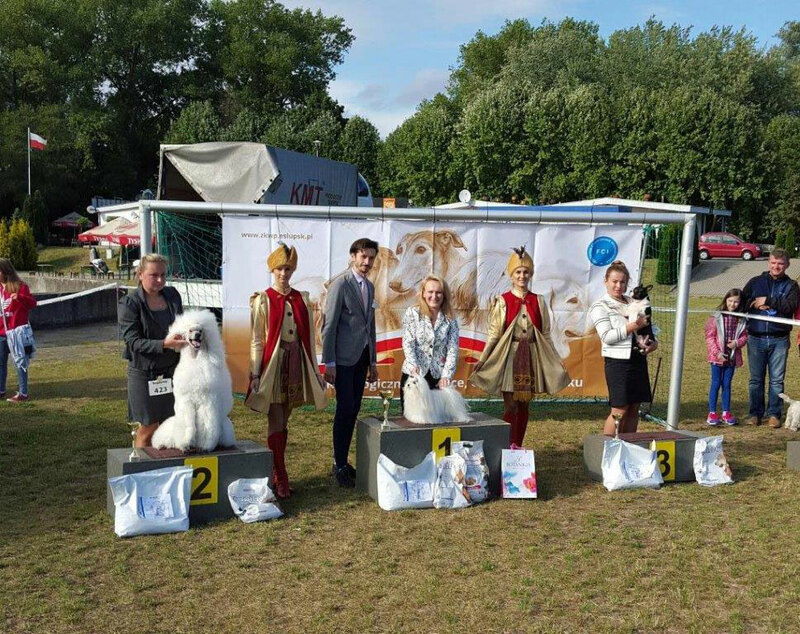 Two exhibitions in Vilnius in the intermediate class and two wins race. At the finals twice in close top six in Group IX. 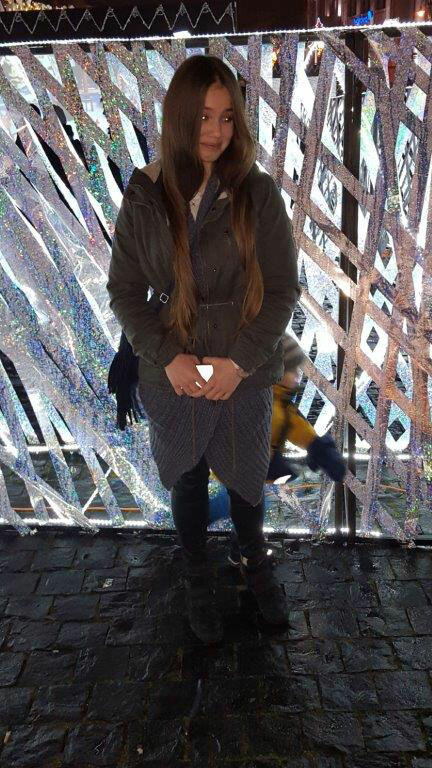 Very nice trip. Thank you Paulina for the beautiful presentation of Praid and taking care of him. 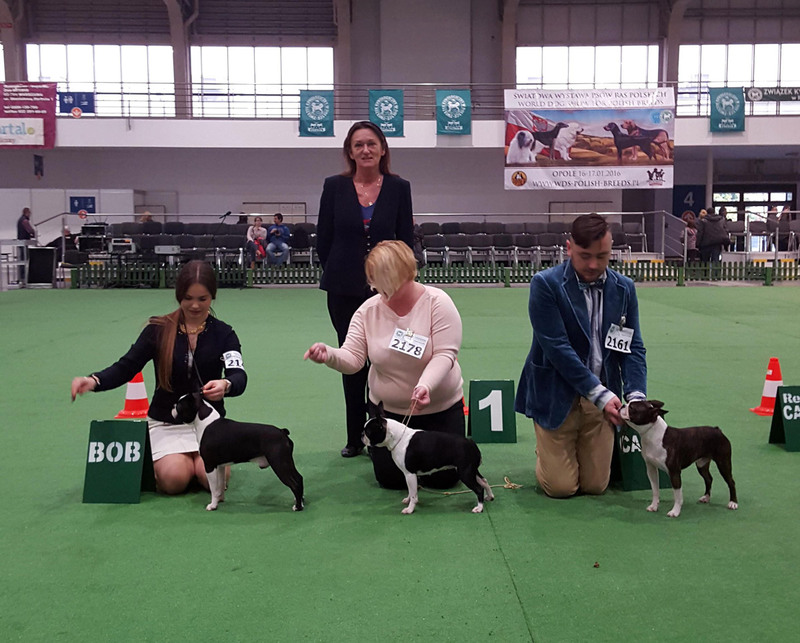 At the national group IX Praid with great success - Best Junior, Best of Breed, 3rd place at BIS Junior and 3rd place at BEST IN SHOW. 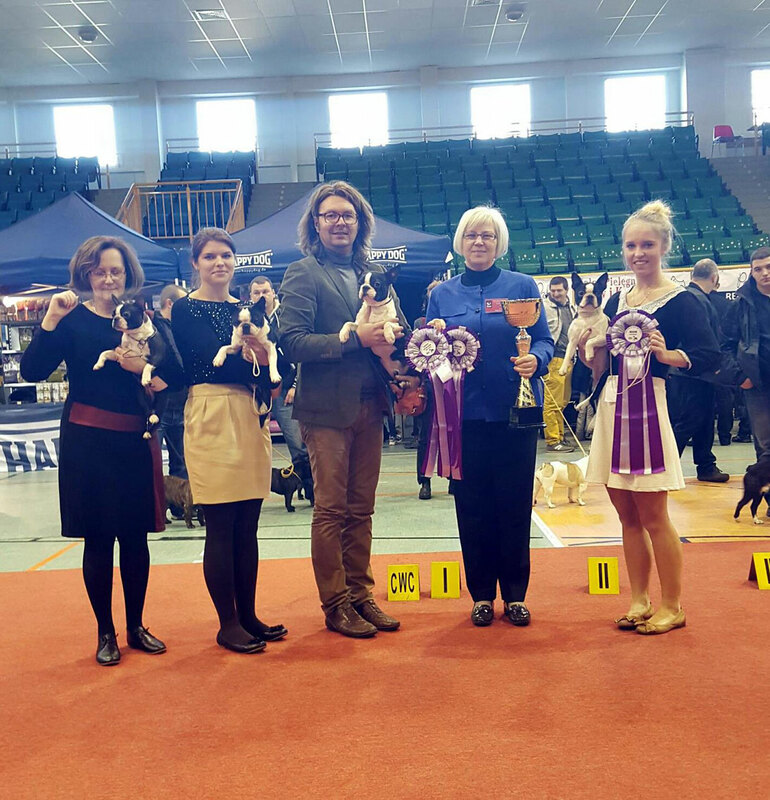 Two international exhibitions in which Praid twice on second place with excellent. 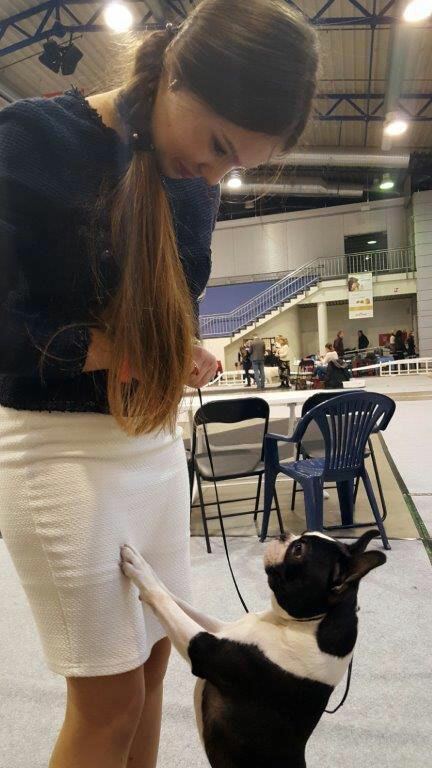 At the exhibition we showed our 3 dogs. 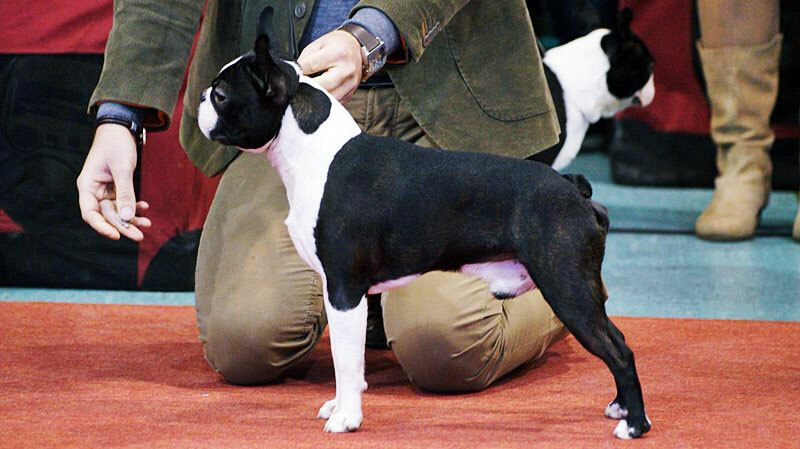 Praid on both shows the best dog in the breed. 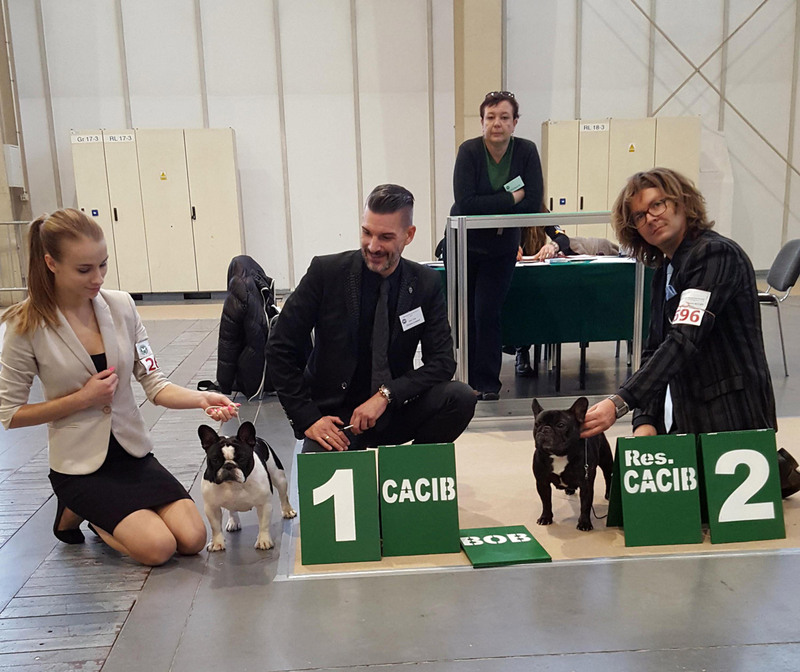 At first day: the IX group winner and at the second day: the best junior exhibition and 3rd place in Group IX. 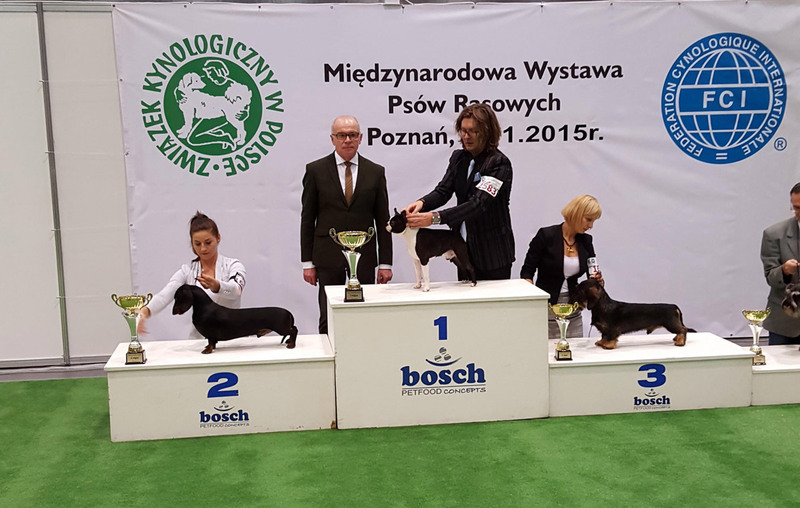 Anne graduated POLISH CHAMPION by winning 2 times the open class and received 2 times RCACIB. 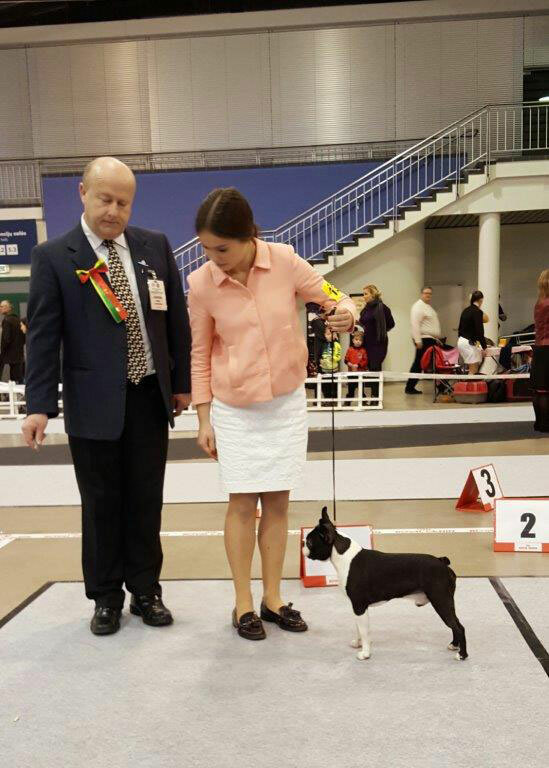 Tekla was only on the first day 3/3 with excellent note. 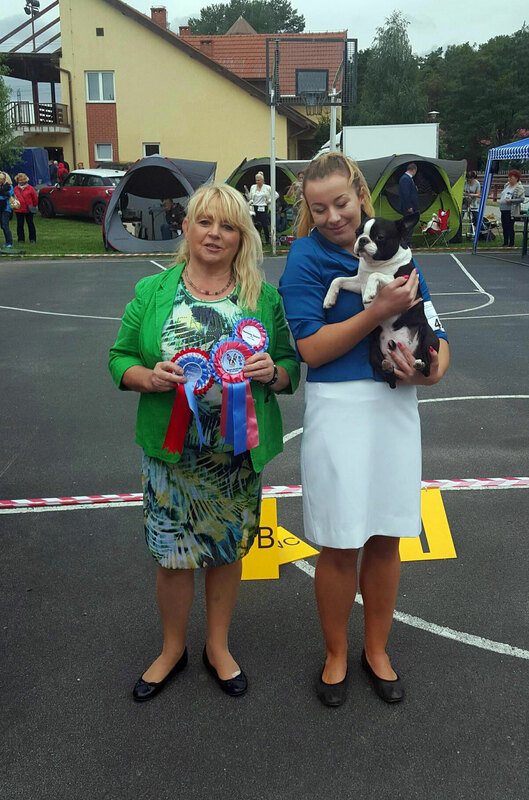 On Saturday Praid was very successful in Koszalin. 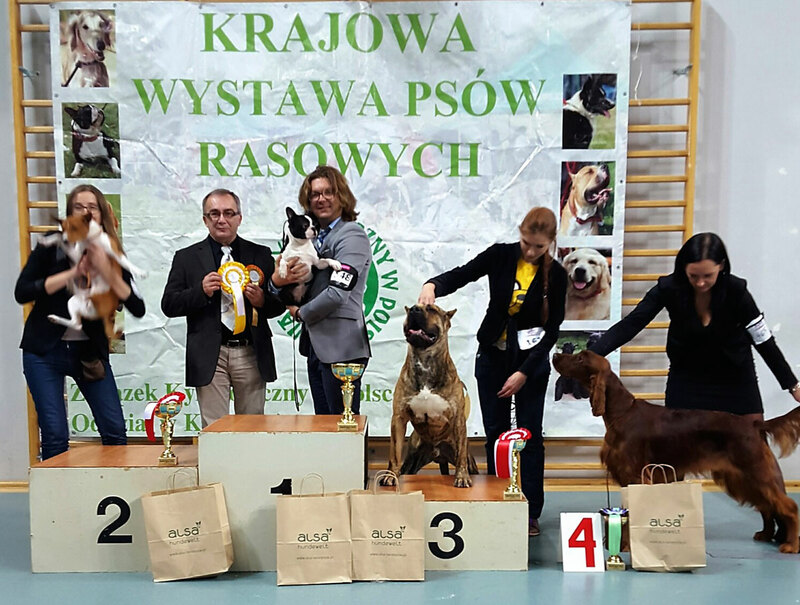 Again, the best in breed and also best junior exhibition and winner of group IX. 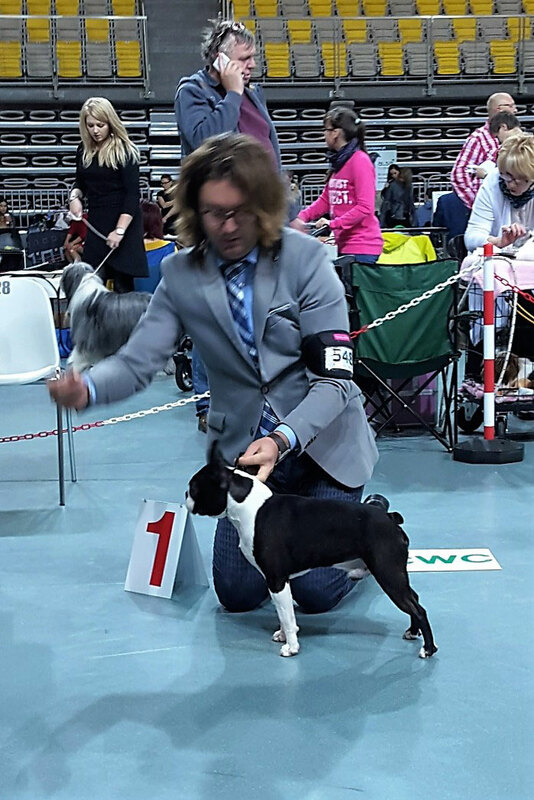 On Sunday Wildax Queen Of Hearts place 2 on 6 in the open class. 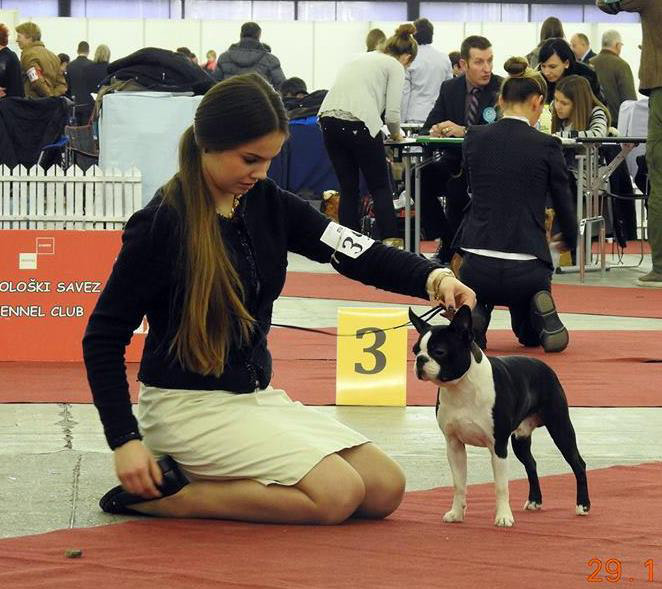 Praid in the junior class the best junior in the breed. 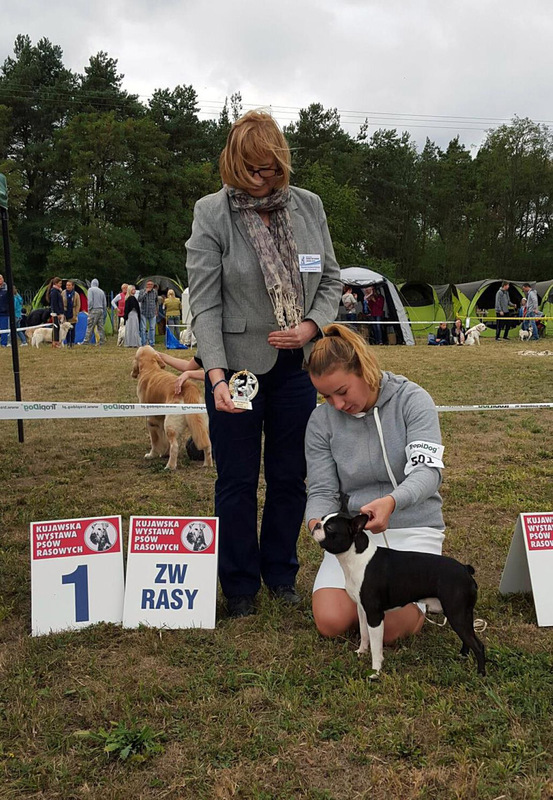 On Saturday Tekla Ewimark Rakownia 2nd place with excellent in rate of 8 females in junior class. National exhibition of group II, VII, VIII, IX Wawrzkowizna near Bełchatów. 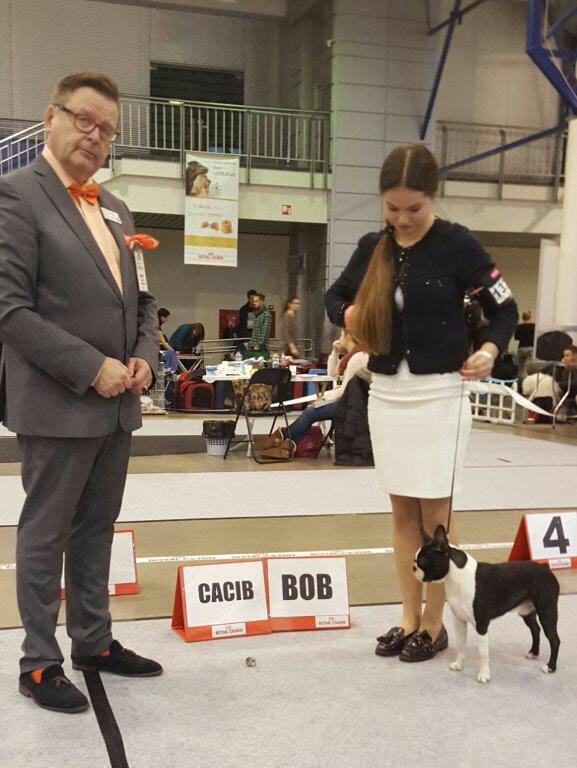 Praid best junior and BOB and in the finals 2nd place at the IX group. 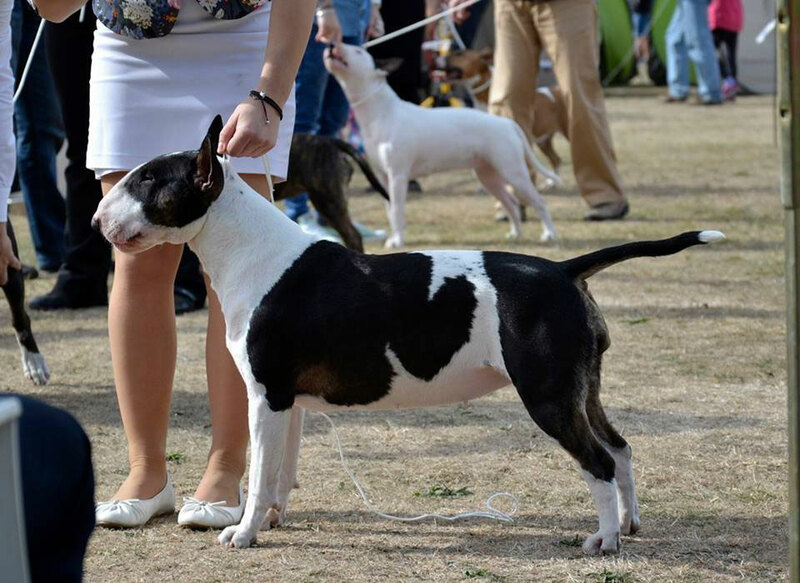 Pola in large group of 9 females won the open class and won the CAC for the championship. 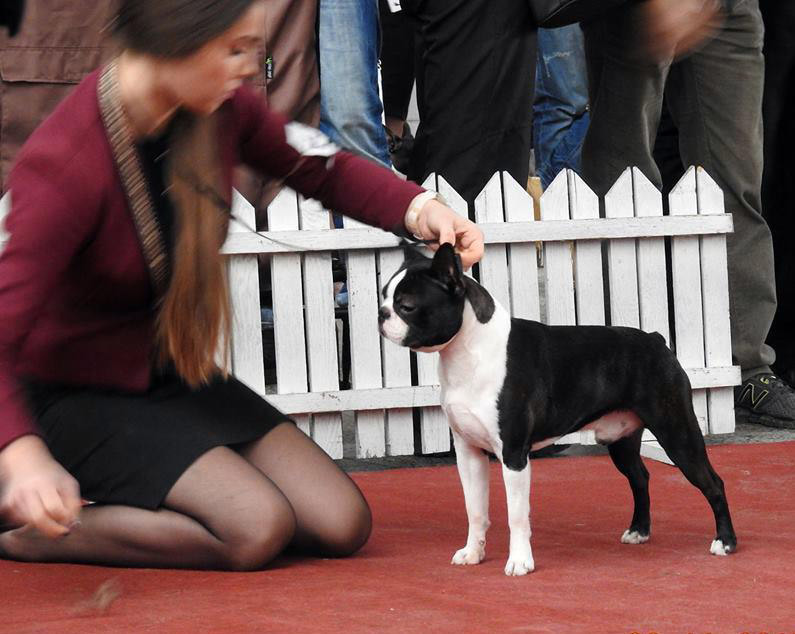 Praid best Boston in race . We drove 2,000 km but brought with Praid LUXEMBOURG JUNIOR CHAMPIONSHIP. It is already 3rd Praid youth championship. 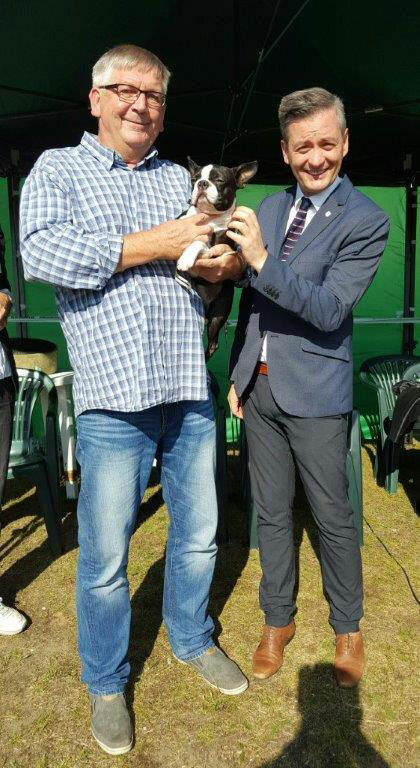 Very nice trip, large exhibition, nearly 4,000 dogs. 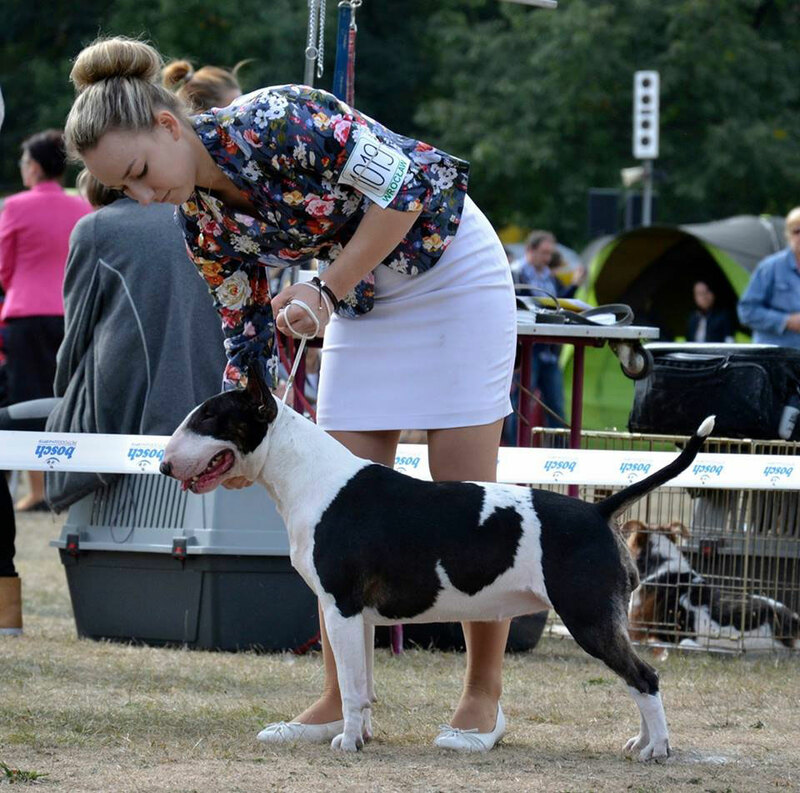 The nice weakend in Sopot on 2 exhibitions nationally and internationally. 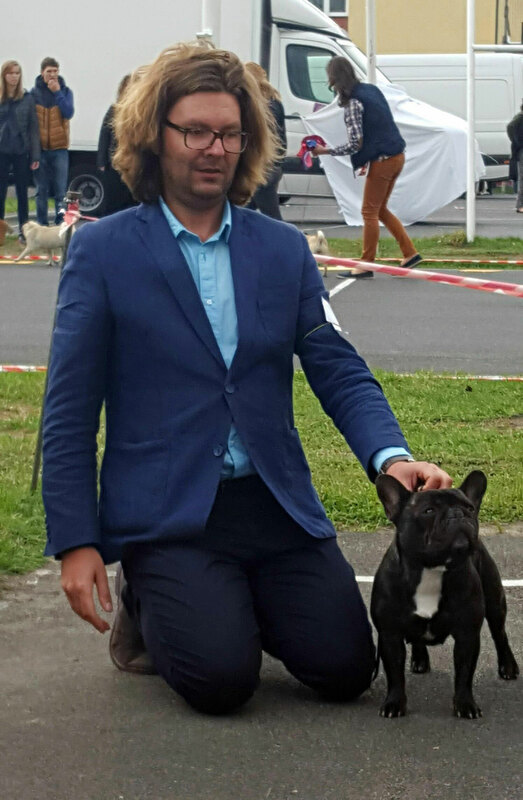 On Saturday at the national group IX Praid best in breed BIS Junior first place. 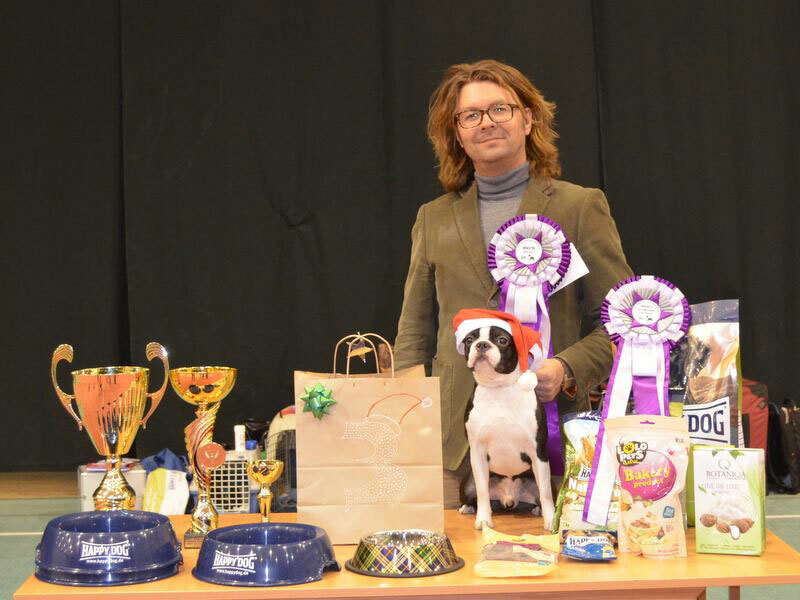 He was also in the final 6 in choosing the best dog of the exhibition. On Sunday, BOB again. 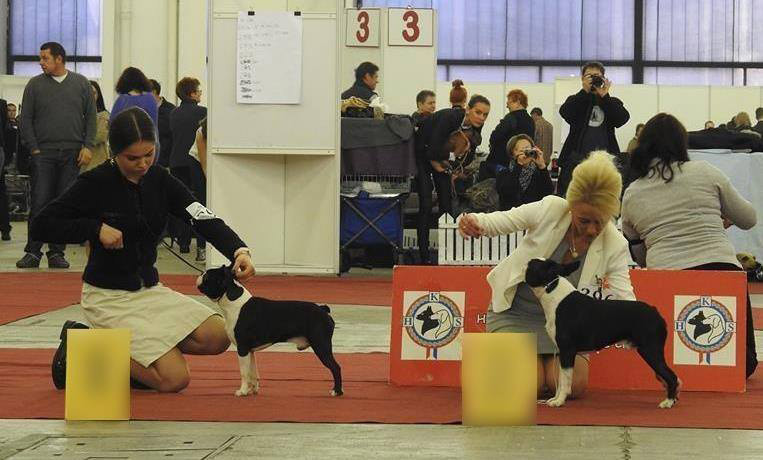 At the finals JUNIOR in the final eight and choosing the best dog group IX 3rd place. We spent a nice time in the terrible heat. Praid was exhibited at 3 international exhibitions in junior class. 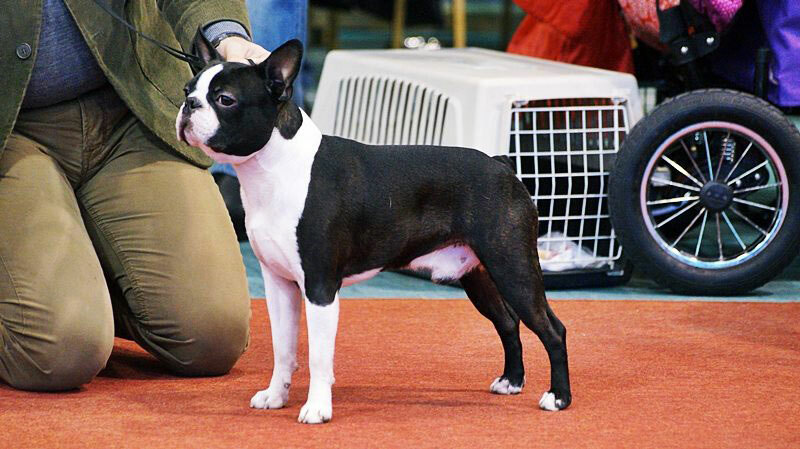 At all shows he was the best in breed. 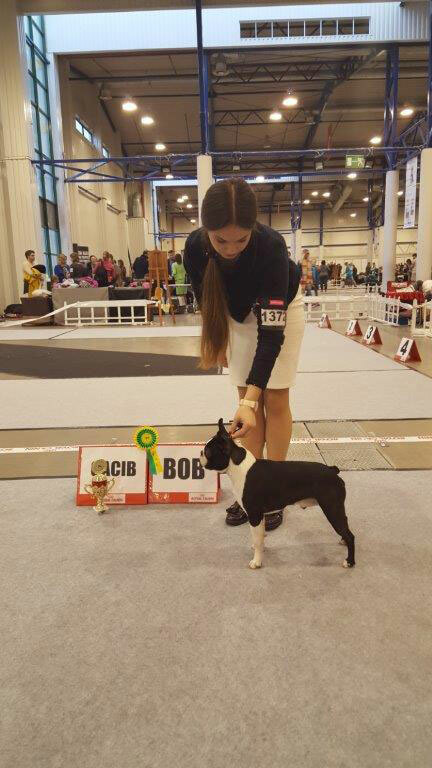 On the first day he received a nomination for Cruft's and at finals third place on BIS Junior and 3rd place in IX group. 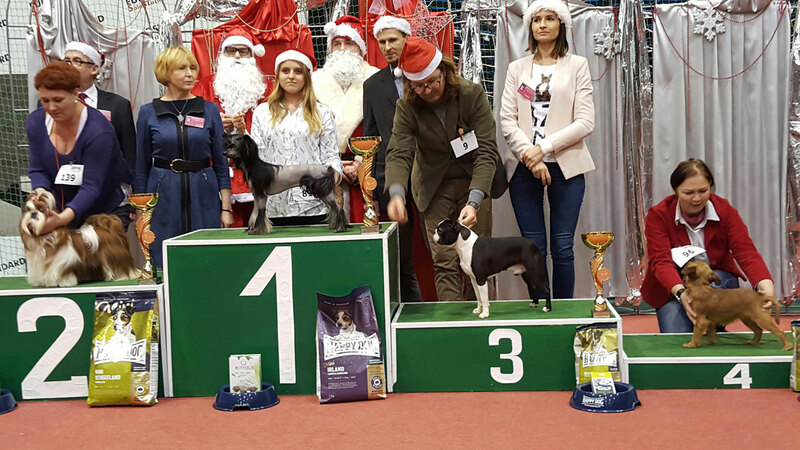 On the second day he received the JUNIOR CHAMPION OF LITHUANIA title. 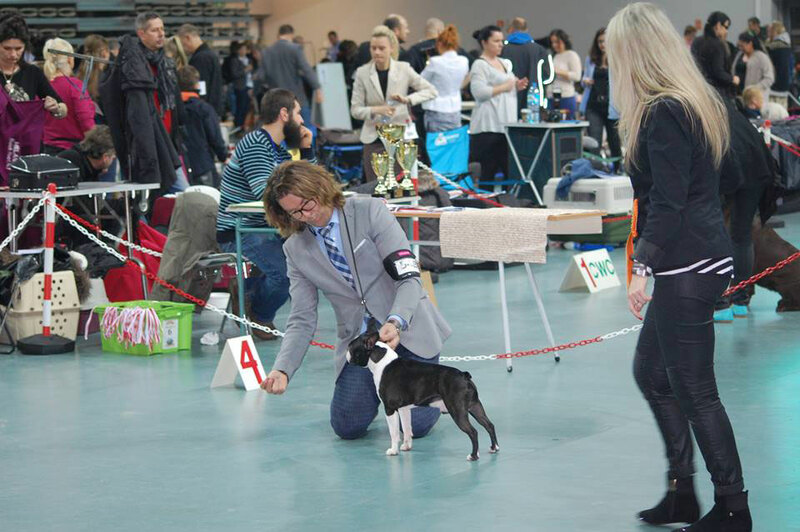 Twice he was in the final 6 best dogs in Juniors and Group IX. He was beautifully presented by Michael Tuliszewski - Thank you Michael. 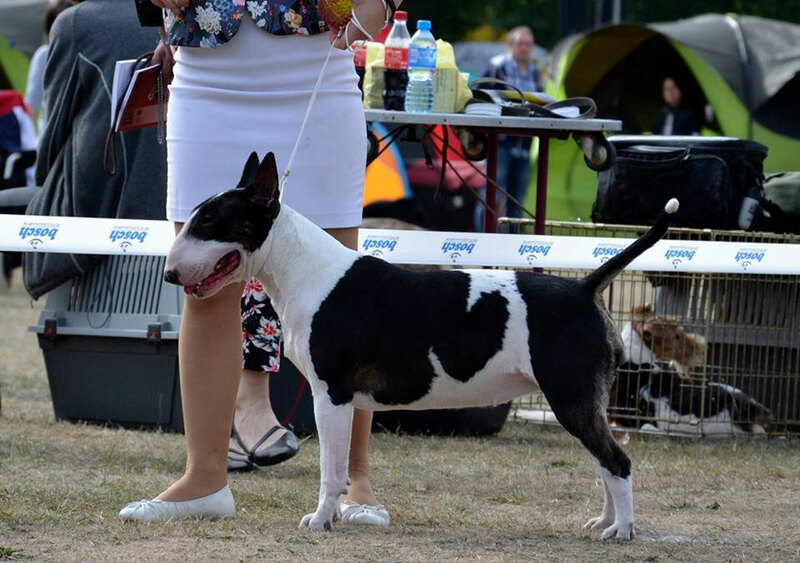 In the Heat on Sunday we showed up at the show in Chojnice. 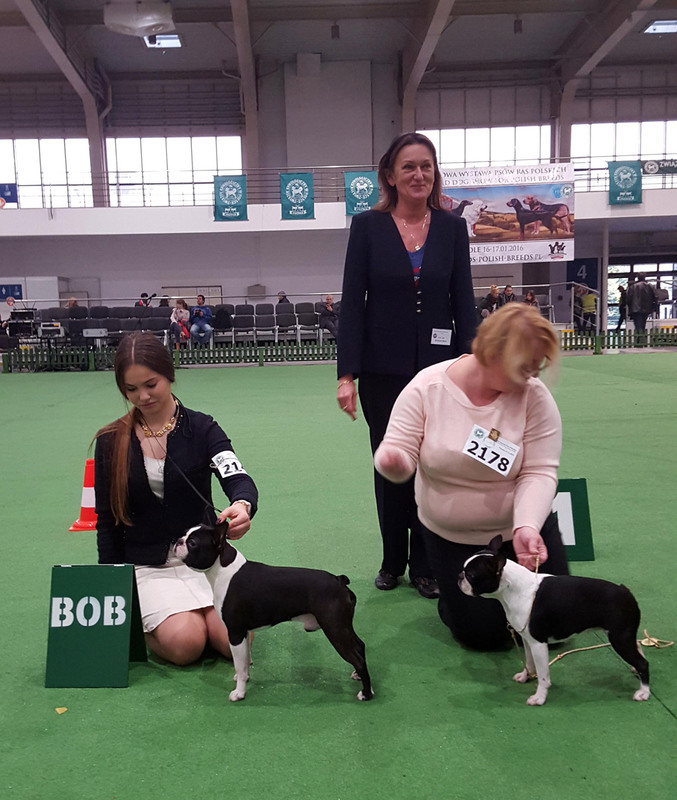 Praid did not disappoint BOB, BOG 1, BIS Junior 4. 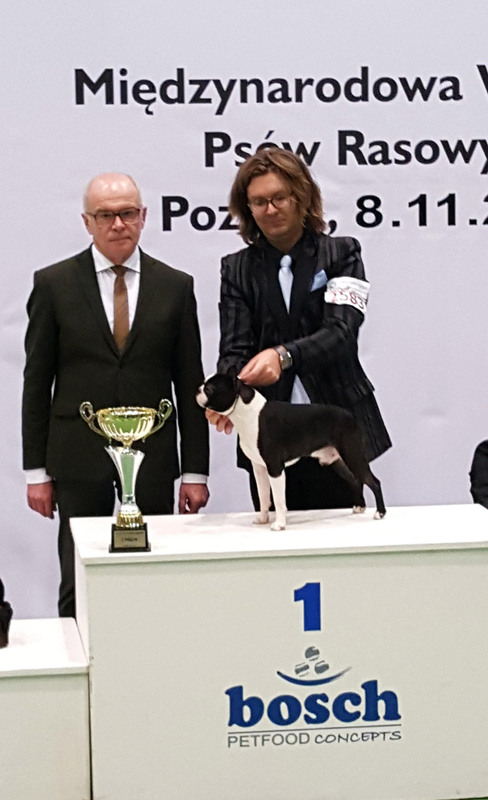 Praid quickly won the POLISH JUNIOR CHAMPION title. 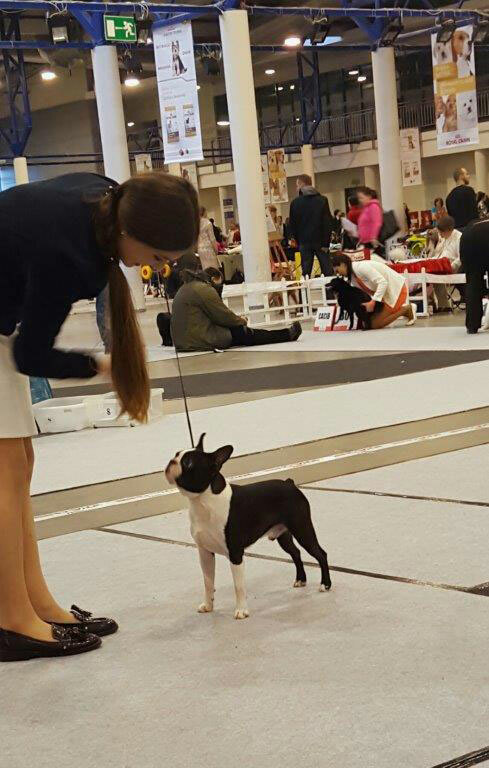 Three exhibitions and three wins in junior class. 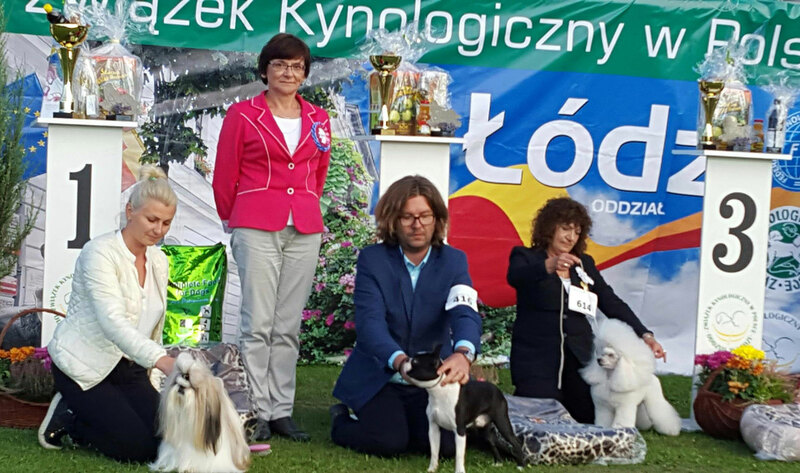 In Koszalin he won the race as a junior, then at BIS JUNIOR 2nd place and finished first place at the Group IX. Many thanks to Sandra for professional Praid show and a nice time in her company. 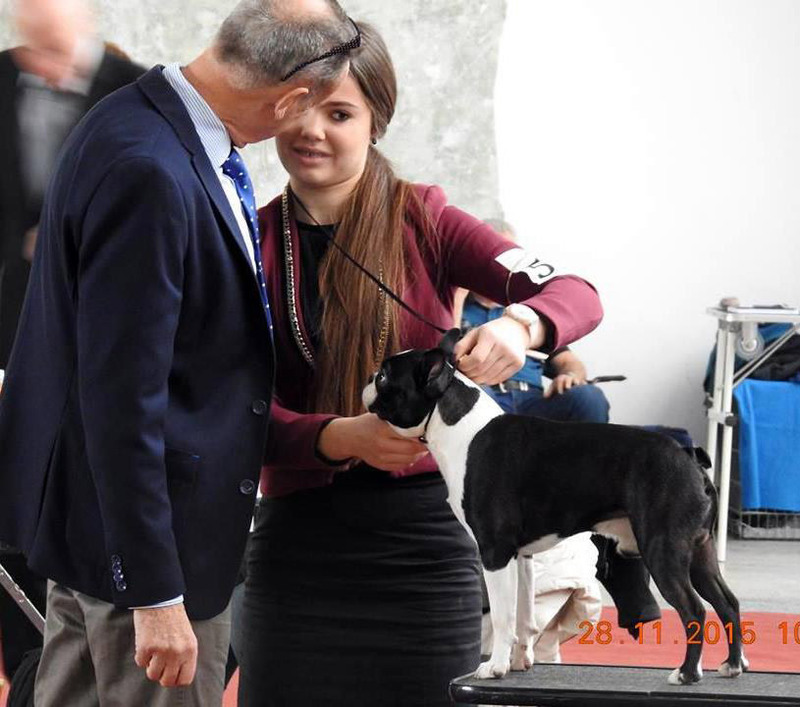 The exhibition at the Lubin our Tekla was the best junior in breed and race winner. Thank you Justin for taking care of Tekla. Super weekend in Gorzow. In 35 degree heat Praid gave us a real joy. 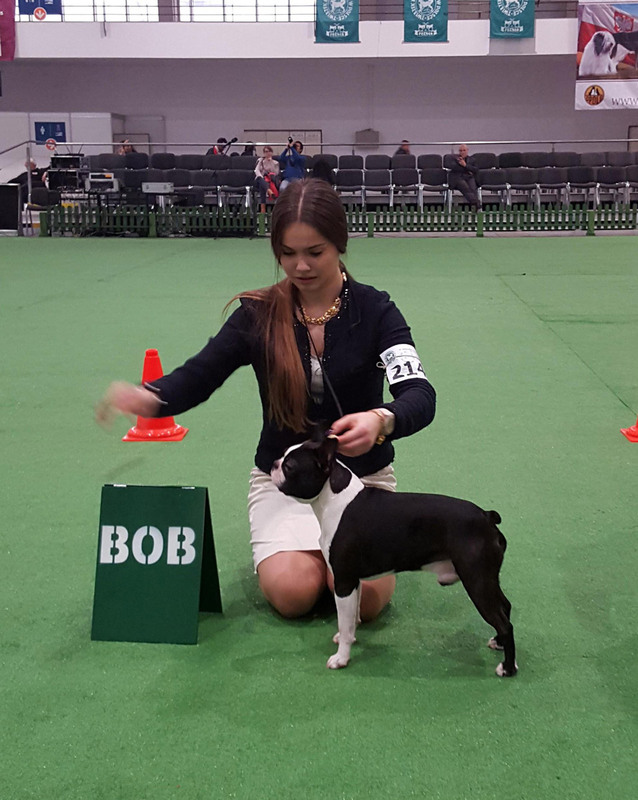 Starting in junior class was unrivaled in breed (BOB). 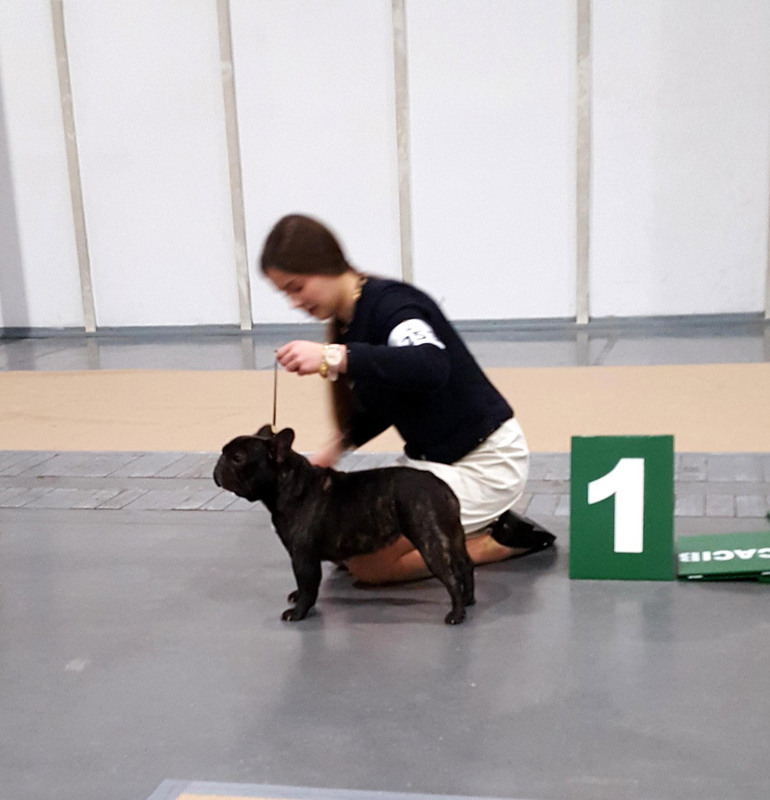 In choosing the best junior exhibition he stood on 3rd place.H e won a 9th group and started to choose of the best dog of the exhibition. 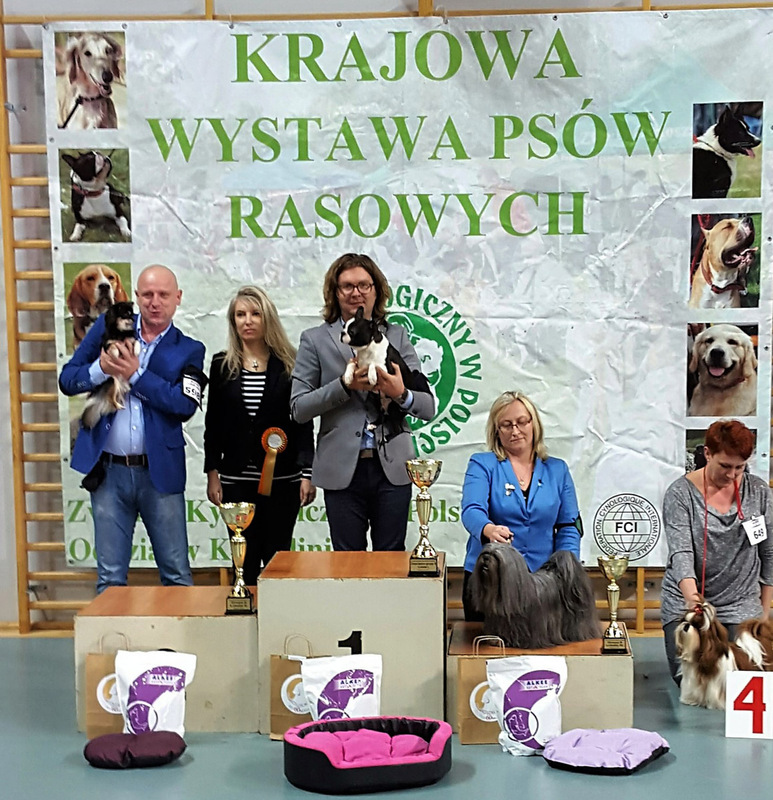 Where he gained recognition judge Dorota Witkowska, which put him on 4th place. 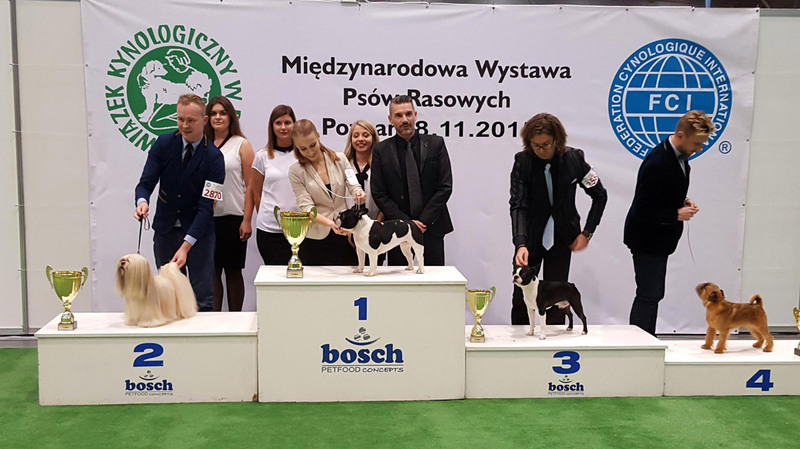 Praid debuted in the junior class at the international show in Szczecin. Praid gave rock. He won the junior class and then the entire race. During Dial selecting the best junior he took fourth place . Plans trip to Milan thwarted hiding in England. Praid traveled courtesy of Michael whom I thank for the care and professional show Praid. 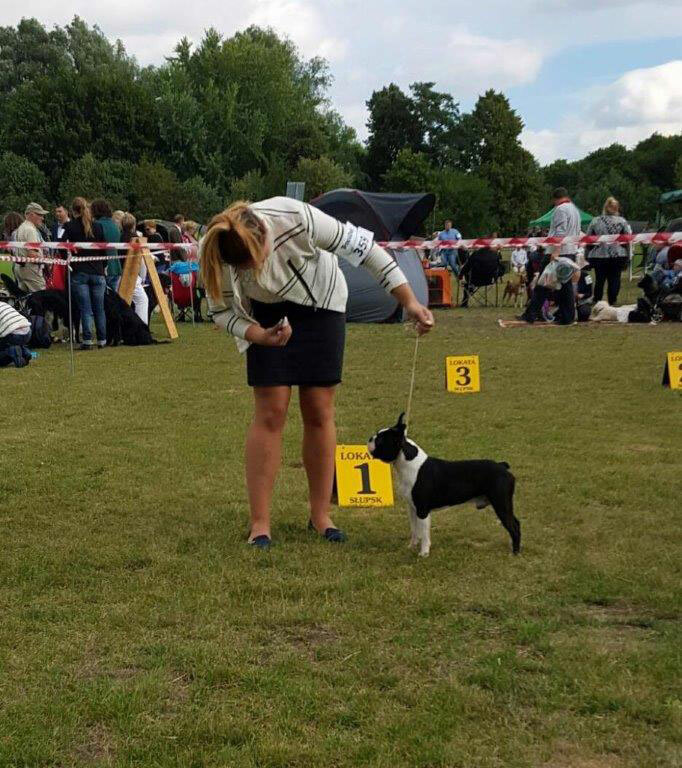 On club show Praid in puppy class 1st with very promising. Again Praid surprised us. 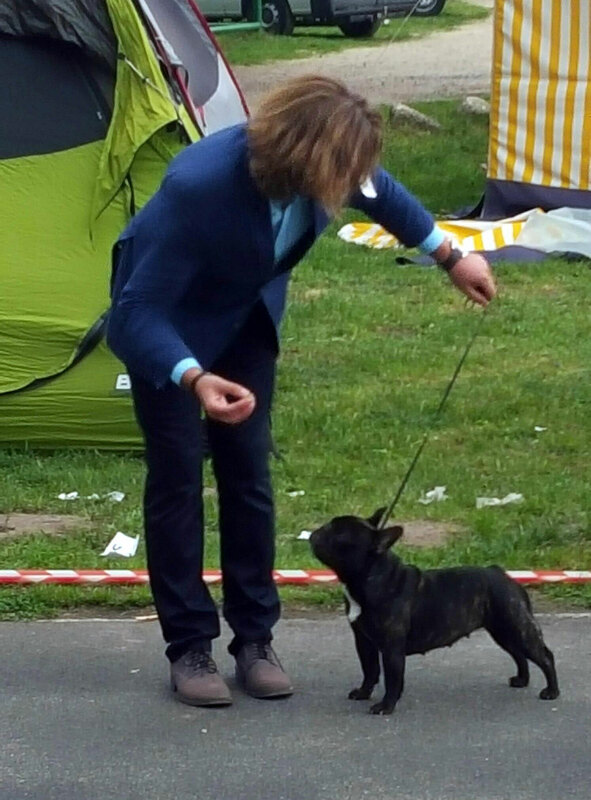 This time at the international exhibition in Leszno best puppy in breed and first in the BIS puppies. 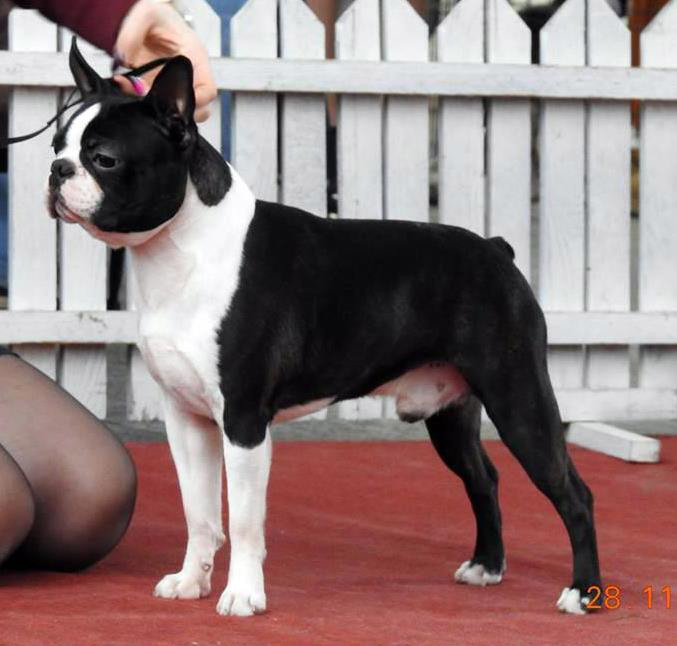 Tekla best junior in breed and Mja first place in open class with excellent note but without the CWC. 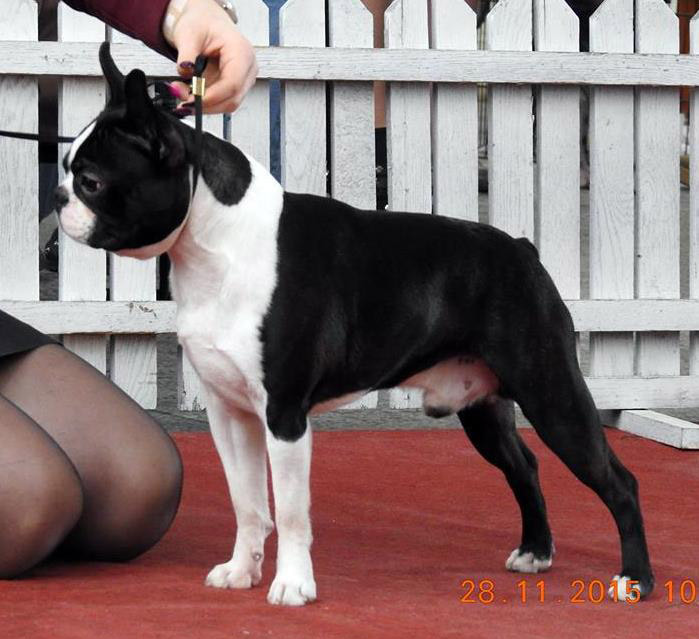 Today, debuted in Lodz in puppy class , our 7 -month Praid. 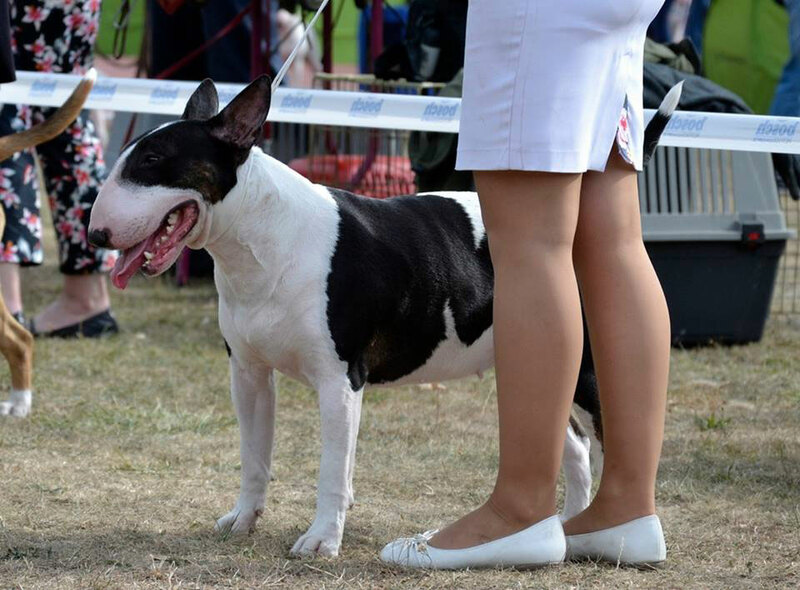 A very successful debut, he defeated two competitors in the class and was the best puppy in breed. 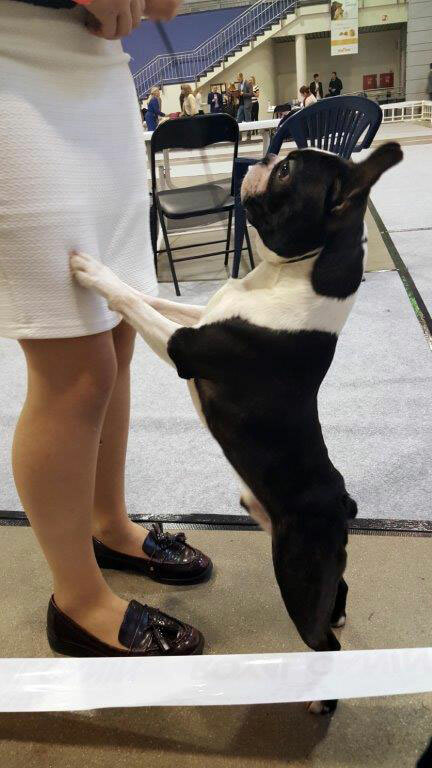 At the finals first place in BIS puppies. 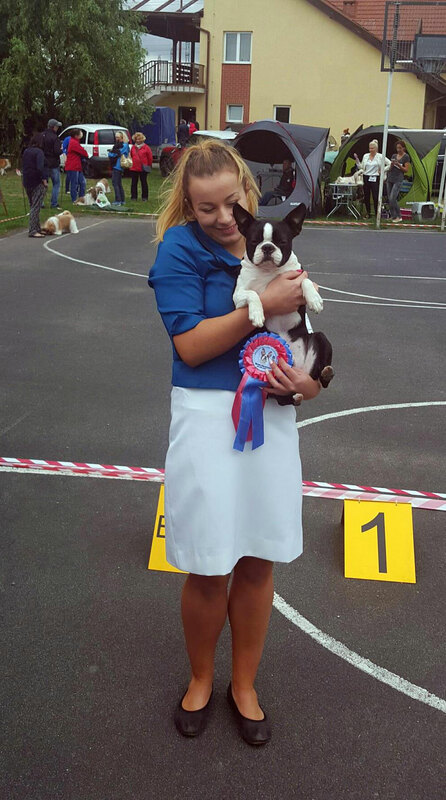 Janis bulldog 2nd place in open class at 12 females reported with excellent. Macy's continued success. 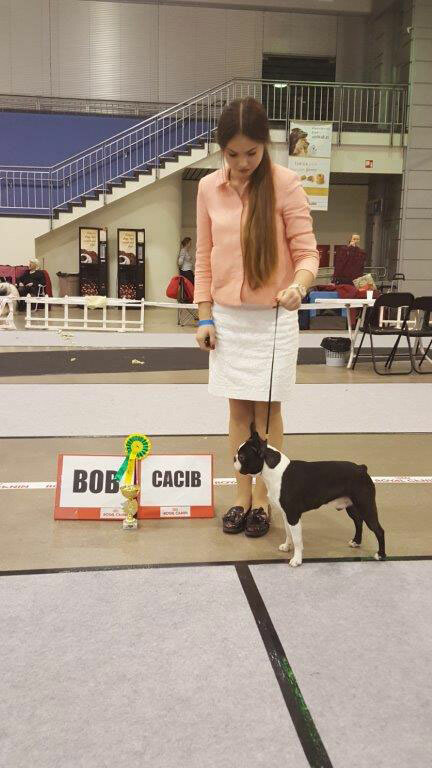 At the national show in Wloclawek Macy best in breed. First place in the group III. Also won the Wojciech Myszkowski Memorial. 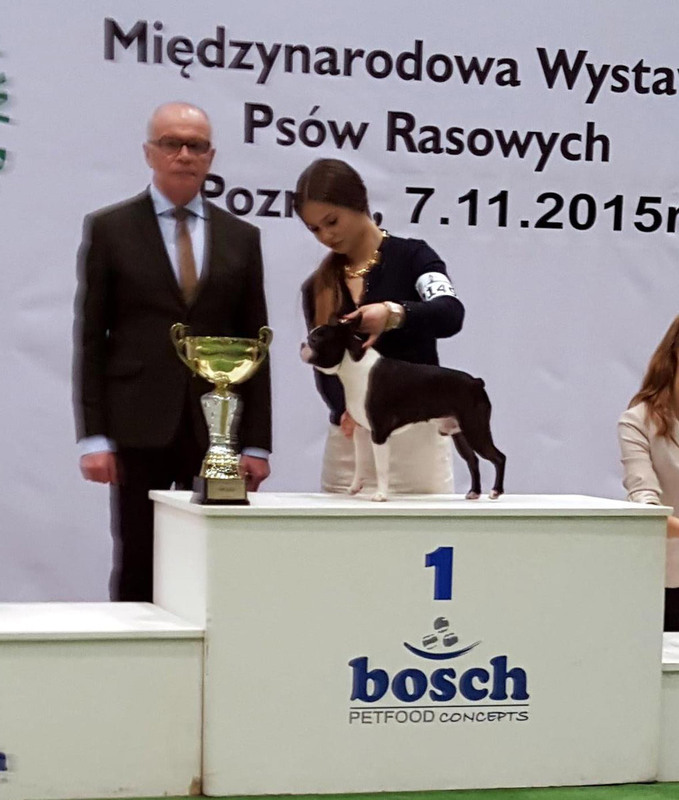 Macy graduated POLISH CHAMPION - Macy Bravo !!! Janis 3rd place with excellent. 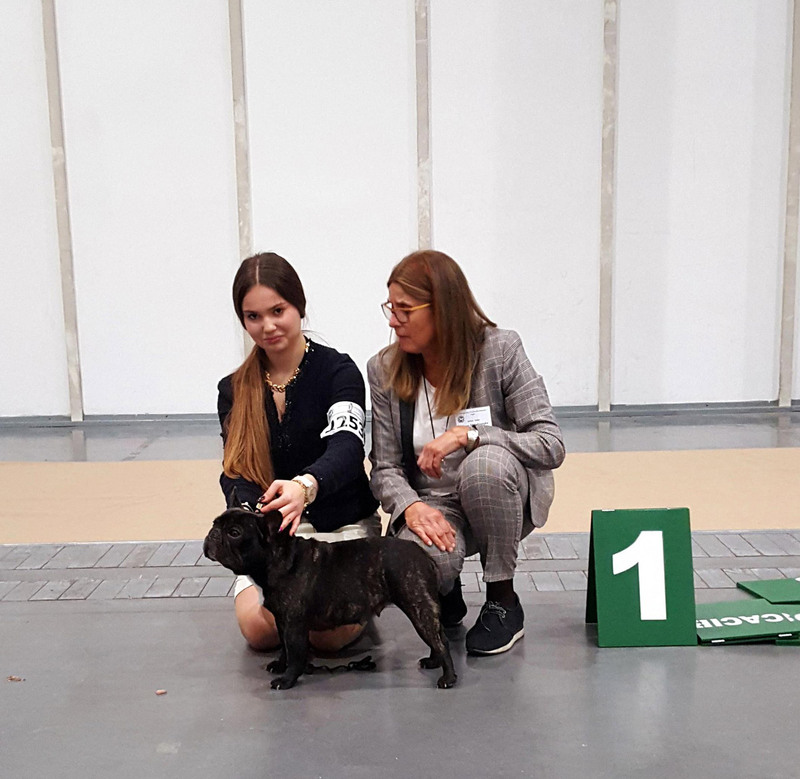 We are very happy that our female Penelope Ewimark Rakownia - "MACY" won the Post Graduate class at the CRUFTS exhibition. She defeated 8 contestants. 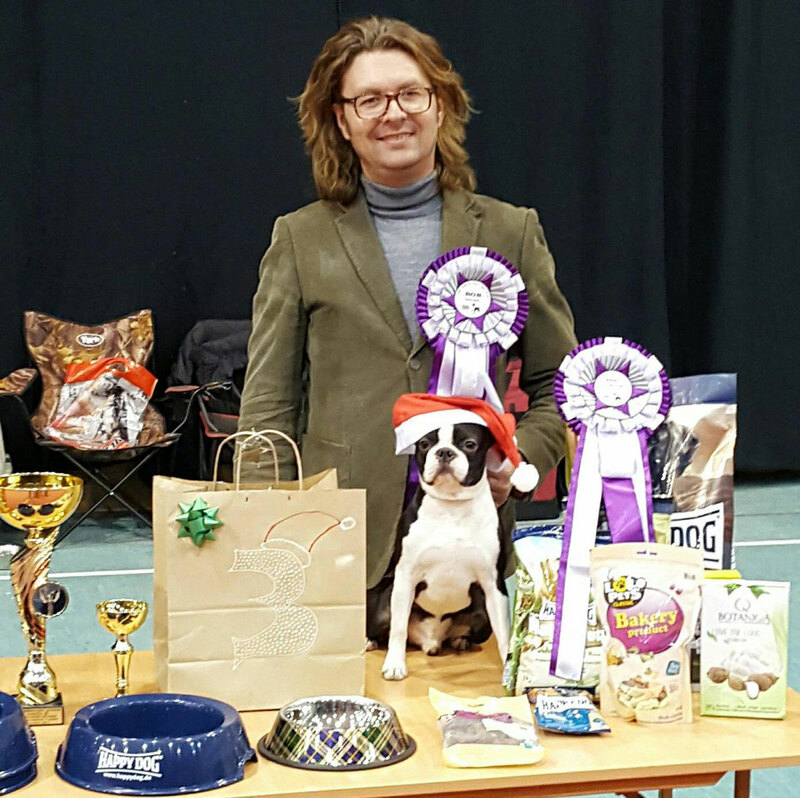 Many thanks to Asia and Rudolph who took her on this fantastic exhibition and achieved such success with Macy. 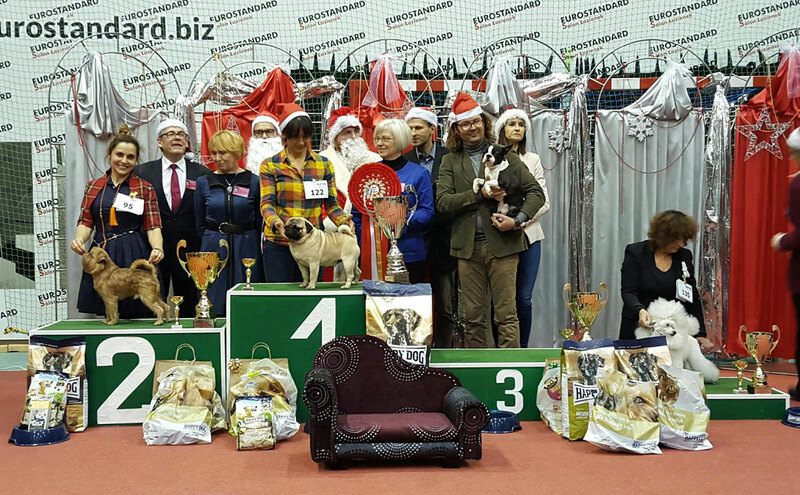 It is already 3th victory of our dogs in this class at this prestigious exhibition. 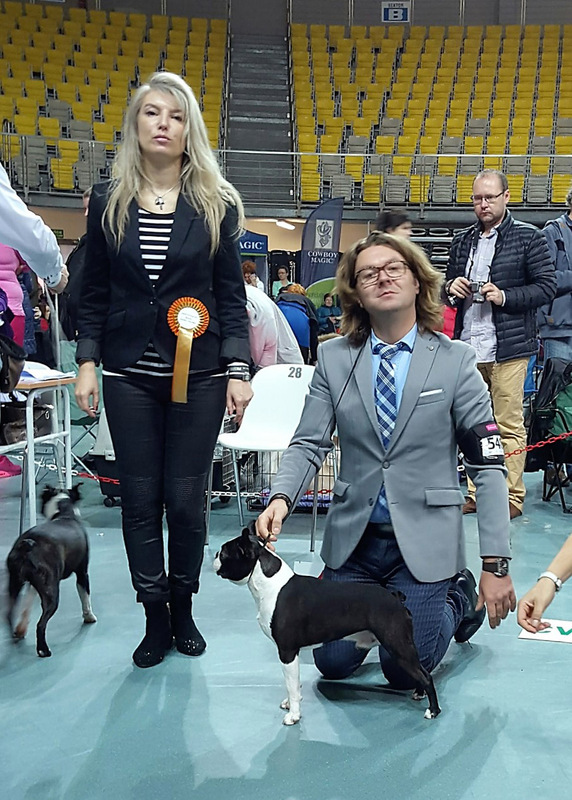 Heidy's beautiful success in Bydgoszcz. Competed in the veteran class by winning it. Beated all competitors in the race BOB. Mrs. judge was delighted as she is in good condition at the age of 9 years old. I would just like to mention that Heidy is in very good health. Heidy's Mom - Sera De Bullcok /Sisi/ also is in excellent form /11 years/ living with us. 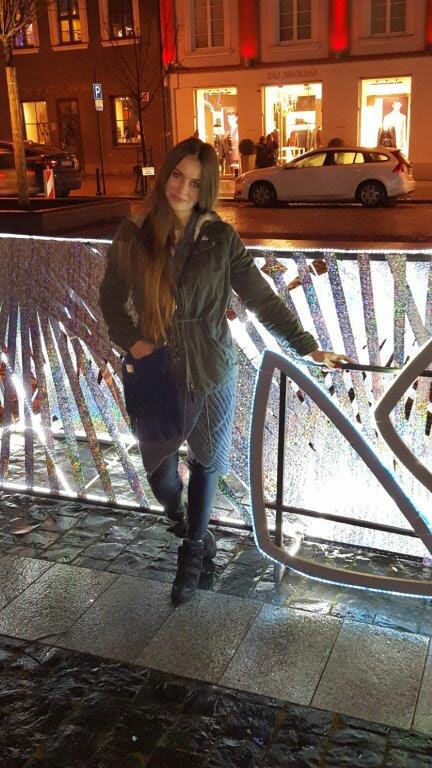 Sympathetic trip to the 4 international exhibitions to Budapest with Penelope. 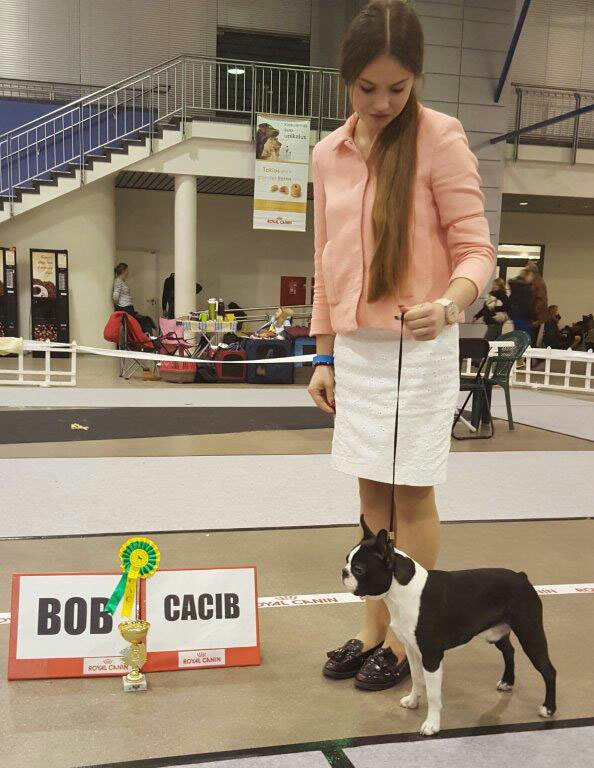 We brought 3 x CAC, 2 x CACIB, 1 x RCACIB, 1 x BOB. Very nice company at the forefront of Casper professional hendler, whom I thank for the beautiful Penelope show. 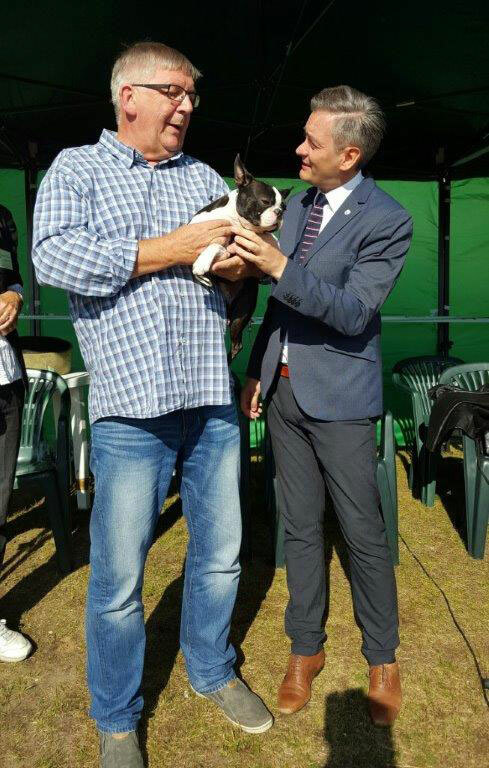 Na dzisiejszej wystawie w Głogowie w klasie pośredniej zadebiutowała nasza Polcia. 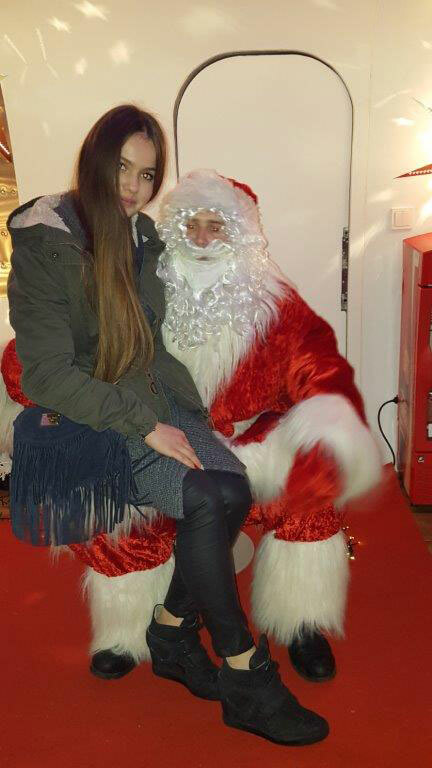 Debiut bardzo udany, Pola pokonała wszystkich przeciwników wygrywając rasę. Bardzo dziękujemy za profesjonalny hendling Łukaszowi Kozlarkowi.